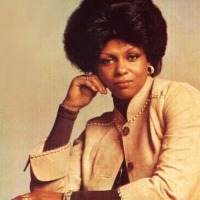 Lyn Collins (12 June 1948 – 13 March 2005) (real name: Gloria Lavern Collins) was an African American soul singer best known for working with James Brown in the 1970s. Contrary to some reports, she is not related to Bootsy Collins, nor Catfish Collins. Born in Abilene, Texas, U.S.A., she began her recording career aged 14. Her biggest solo hit was the James Brown-produced gospel-style song "Think (About It)", from her 1972 album of the same name on People Records. The song contains 5 breaks which have been widely sampled in hip-hop and drum and bass, most famously, the "Woo! Yeah!" and "It takes two to make a thing go right" loops in Rob Base and DJ E-Z Rock's It Takes Two which is composed almost completely from samples of Think including a few lines of Collins' vocals. Furthermore, it was used in the early sociocritical eurodance classic I Can't Stand It by Twenty 4 Seven. Another album followed in 1975 Check Me Out If You Don't Know Me by Now. After the release of this album, she returned to performing mainly as a back-up vocalist. In the late 80s and early 90s, Collins attempted a comeback as a dance/club diva, recording the house single "Shout" for Belgium's ARS label. In 1993, Collins' profile was given a boost by female dancehall singer Patra, who invited Collins to perform on her hit remake of "Think (About It)"; partly due to the resulting interest, her two official albums were reissued in England and the Netherlands. Collins continued to tour and perform, most notably at the European Jazz/Funk Festival (in both 1998 and 1999) and the Montreux Jazz Festival. In February 2005, Collins embarked on her first ever solo tour. For three weeks, she performed in the United Kingdom, France, Germany, Austria and Switzerland. The tour was produced by the Soulpower organization. Shortly after returning from her European tour, Collins died aged 56 in Pasadena, California, of cardiac arrhythmia. In 2006, Paris based Hi&Fly Records released a live album titled "Mama Feelgood", which included recordings from her European tour and some interview clips. This release was produced by German-born DJ Pari, who has also produced for Marva Whitney and who has managed Collin's last tour. An official anthology CD, also called "Mama Feelgood", was released on Universal Music that same year.